Declaring objects of specified type. Migration to NET from VFP. DOES.NET technology allows you writing and executing expressions and scripts in NET languages without compilation. CODEDOM assembly makes DOES.NET unuseful in NET Framework. But this technology can be really useful in Silverlight (in browser) where CODEDOM is absent. You can declare and use dynamic variables (objects) right in scripts without compilation. If you used dynamic languages earlier then you be glad receiving ability to use dynamic code, macro substitutions and other powers of simple interpreter in Silverlight. DOES.NET is a minimal set of means to create any dynamic code (except type declarations). This part of documentation describes DOES.NET technology using without internal details. 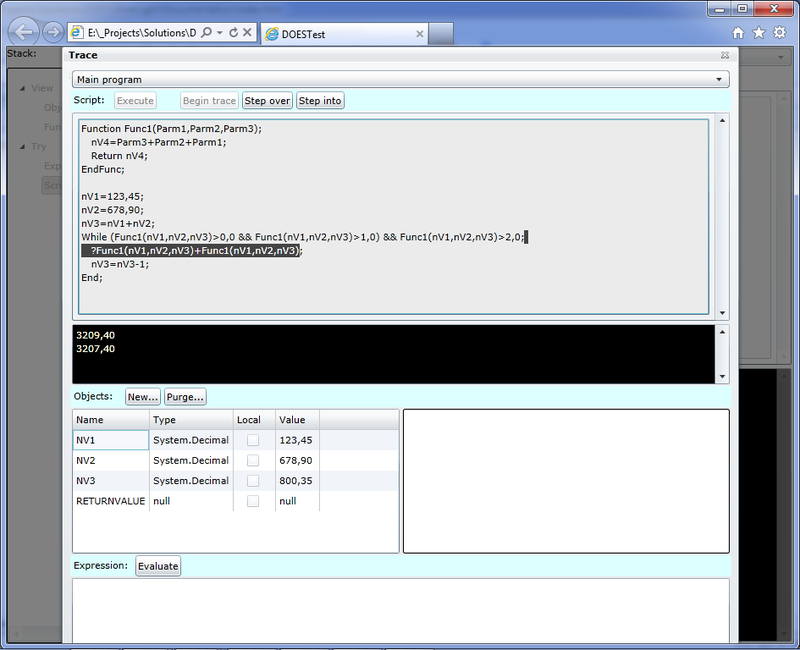 DOESExplWPF.dll - DOES.NET explorer type and trace window. Include references to these dll into your project and add using DOES; using DOESExplWPF; into code.
! DOES.NET solutions were created for internal use in our projects. Let us know about your interests and problems and we'll try develop this technology and fix bugs. You should call Init method of Does class object to initialize it. And you can change any default settings to optimize memory use before initialization ofDoes class object. These settings depend on how many dynamic objects and functions you plan to use in your scripts. These are just initial values. DOES.NET uses these values to create tables. But if the length of any table is exceeded when DOES.NET try to create new object, then DOES.NET increases a size of table. But this operation takes additional time and memory. Error occurs if you don't call Init() method before Does class object use. Next example demonstrates few main DOES.NET abilities and has not any sense. You can see the technique when DOES.NET dynamic objects of any types can be declared, you can assign values to them before executing of DOES.NET scripts, and take values back from DOES.NET objects after script executed. Note! Use comma or point in numeric constants to convert them to Decimal (0,00 or 0.0). Else constant will be converted to Int32. Dynamic objects in DOES.NET can have one of three status: Public, Private, Local . And they can be declared and be accessible from NET language code or inside DOES.NET script. Object names are case insensitive. Public objects are objects declared in root (zero) stack level and can be accessible from any function in any level of stack. Private objects are objects declared in any stack level and can be accessible in current function and in functions called from current (in next levels of stack). Local objects are objects declared in any stack level and can be accessible only in current function. To declare DOES.NET objects in C# code use methods Declare and Set of Does class object. public bool Declare( String Name) - this method declares object without value assignment. public bool Declare( String Name, Object Value) - this overload of Declare method allows to declare object and to assign value of any type. public bool Set( String Name, Object Value) - actually equals to Declare overload. If object with the same name already exists then two last methods just replace its value without exception creating. First method do nothing. If dynamic objects was declared in script (in root stack level) then they also can be visible after script executed and can be accessible from C# and VB# code. DOES.NET creates dynamic objects for each name listed after directive and delimited with comma. Use function New(sType) to declare DOES.NET objects of specified type or to replace existing objects with new values of specified type. "...; Var10=New(\"System.String\"); Var10=\"This is string\";...; Var11=String.Copy(Var10); ...;"
You must pass valid type name as string as parameter into function New. And assembly should be accessible. Public objects can be accessible from anywhere. Private objects can be accessible in current function and functions called inside current. But if private object with the same name is created in nested function (sublevels of stack) , then public object and private objects of higher levels with the same names will be inaccessible from this function and functions called from this function. All local variables, declared in function, hide public variables with the same names and private variables with the same names declared in external functions (higher levels of stack), but only inside current function except nested functions. You don't need declare private variables inside script using Private command. When you assign value to variable then DOES.NET creates new private object if object with this name doesn't exist. "...; Clear nVar1,nVar2,nVar3; Clear *Var1,nVar*,*Var*;"
Any way use * in beginning or end of mask or full object names. Expressions in DOES.NET can consist from references, DOES.NET functions , constants and operators. References can be to: DOES.NET objects; Types in available assemblies; members of objects; static members of types; elements of arrays. Search in type declarations in assemblies. Mathematic: +, - , * , / . Script lines can include expressions. And you can evaluate expressions in DOES.NET explorer. take members of single operation in brackets!!! Simply use DOES.NET object names to operate their values in expressions. Object names are case insensitive. If a type has static members then you can call such static methods or refer to static fields and properties of this type. If you use type name without assembly specification then DOES.NET searches type in all available assemblies and only if dynamic object and functions with the same name aren't found before. But you can optimize this searching. Type names are case sensitive. and etc... Member names are case sensitive. Each name-identifier, found in expression, DOES.NET searches in objects tables first. Second - in functions tables. Order is from current stack level to root. The scope of visibility is the same to objects. The number of parameters can be less or equal to number of parameters declared for this function. Function names are case insensitive. You can essentially increase a speed of script executing with using of this references optimization. Use Does class method static bool Not(Object _val) or static bool not(Object _val) to make unary inversion. It looks like "...; IF Does.Not(False); ...;"
In general DOES.NET is a technology of macro substitutions for NET languages (C# and VB). But you can use nested evaluations inside scripts. In all cases you can evaluate just completed commands and can't substitute separated clauses (like in FoxPro). And any member of expressions (except operators) can be as string subexpression stored in variable. Method Execute(sScript) allows script executing. Dynamic objects with using directives: Public, Private, Local. If you create an object which inherits this interface and store the reference to this object to Does.Console field, then you can use directive ? to write e result of expression onto your console. See script example above. If a command of DOES.NET script begins with // symbols then Does.Execute accepts this command as comments and does nothing. DOES.NET functions can be public if declared in root stack level and private (if declared in stack sublevels). Private functions will be released after script executing by Does.Execute(sScript). First parameter is a function name. Second parameter is a list of names of arguments (just names). Third parameter is a script of function body. Use Return command to return value from function. For example: "Return Parm1-Parm3;"
Return value is also placed into variable with name ReturnValue in parent function or script (which calls current function). < UserControl x :Class ="DOESTest.MainPage"
After this you can call DOESExplorer as children window from your code and can pass working oDoes instance to explore and trace. Objects - list of dynamic objects at top and tree of properties of current in top list object - at bottom. Functions - list of dynamic functions at top and textblock with code of current in top list function - at bottom. Expression - text box to write DOES.NET valid expression at top of page and scrolling area with results of expressions evaluations at bottom of page. Scripts - text box to write DOES.NET valid script at top of page and scrolling area (console) with result of script executing at bottom of page. In page with objects you can create new objects of specified type and can select from list of assemblies and types ( "New..." button to call list of assemblies). In page with functions you can just list functions and see their code. In "Expression" page you can write any DOES.NET expression, evaluate it and watch the results of evaluations. 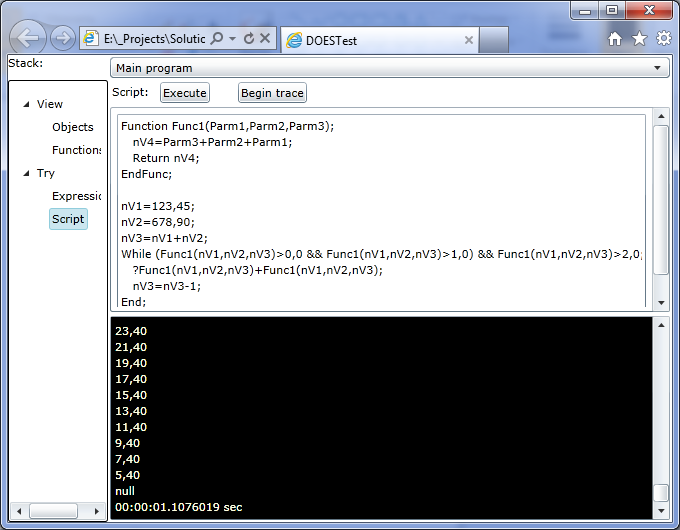 You can call script debugger from DOES Explorer by "Begin trace" button or in code of your NET program. There is a class DOESTrace declared in DOESExplWPF.dll which implements IDOESTrace and you can create object of this type and can call to debug from your code. Create object of type DOESTrace and store reference to this object into Does.Trace before Does.Execute call. Does.Execute calls trace window on each line of your script. oDoes.Trace = new DOESTrace (oDoes); // pass oDoes object as parameter into constructor! You can change a default sizes of table before oDoes.Init() method call. But the size of table is not fixed, and DOES.NET can expand table dimensions if size is exceeded. Purge table. When you clear objects, DOES.NET just free elements of name table and doesn't compress table. During purge operation DOES.NET shifts all objects to top of table with removing free elements of table. But if there are no free elements in table and after purge operation a size of table still exceeded, then DOES.NET expands table with 3000 new elements. Each element of objects name table keeps: a name of object, reference to object and "local" status. To clear object DOES.NET just replace a reference to name-table-element and object with null. Further just NET FrameWork knows how and when to free memory (if there are no other references to this object). So, you have to control objects life time by yourself if needed (for example with usingIDisposable interface). Function name table is similar to object name table. But element of function-name-table keeps: the name of function, list of argument names and script of function body as string. Each element of stack (each level) has a structure. Does.MaxStackLevels property before Does.Init() call. Returns first argument if it bigger than second, else returns second. public bool Declare(String Name) Declares private dynamic object with name Name and null value. public bool Declare(String Name, Object Value) Declares private dynamic object with name Name and assigns Value. DeclareFunction public bool DeclareFunction(String Name, String Args, String Code) Declares dynamic function with name Name, list of arguments Args and body script Code. DeclareLocal public bool DeclareLocal(String Name) Declares local dynamic object with name Name and null value. public bool DeclareLocal(String Name, Object Value) Declares local dynamic object with name Name and assigns Value. public bool DeclarePublic(String Name, Object Value) Declares public dynamic object with name Name and assigns Value. DoCmd public Object DoCmd(String Cmd) Executes single command. In difference to expression evaluation command can be assignment and can have left and right sides. Evaluate public Object Evaluate(String Expr) Executes expression and returns result. Executes script. Script is a set of commands. Returns second argument if first argument is true else returns third argument. Init public bool Init() Initializes Does class object. Should be called before Does class object using. You can change default values of properties PublicObjectsDefault , PrivateObjectsDefault, PublicFunctionsDefault, PrivateFunctionsDefault and MaxStackLevels before Init(). Get public Object Get(String Name) Returns value of dynamic object by name. New public Object New(String Type) Creates and returns object of specified type Type . Type is full name of type in assembly. Negation. Unary operation. Boolean inversion. Release public void Release(String Name) Deletes dynamic object. Name can be mask like *mask, mask* or *mask*, or name of object. Set public bool Set(String Name, Object Value) Replaces value of dynamic object with name Name with reference to object Value. If dynamic object with name Name doesn't exist then private object with this name will be created. Console public IDOESConsole Console Replace this field with reference to IDOESConsole object to use output values by ? directive. ErrorCode public int ErrorCode Check after Does.Execute() , Does.DoCmd() and Does.Evaluate() . If there are no errors then Does.ErrorCode is 0. Else has a code of error. ErrorFunction public String ErrorFunction The name of function where error occurred. ErrorException public Exception ErrorException Exception object if unhandled error occurred. ErrorLine public int ErrorLine Line of script or function where error occurred. ErrorMessage public String ErrorMessage Error message. MaxStackLevels public int MaxStackLevels = 1000; A length of stack. Change this value if needed but before Does.Init() call. PrivateFunctionsDefault public int PrivateFunctionsDefault = 1000; A default length of private functions name table. Change this value if needed but before Does.Init() call. PrivateObjectsDefault public int PrivateObjectsDefault = 5000; A default length of private objects name table. Change this value if needed but before Does.Init() call. PublicFunctionsDefault public int PublicFunctionsDefault = 1000; A default length of public functions name table. Change this value if needed but before Does.Init() call. PublicObjectsDefault public int PublicObjectsDefault = 5000; A default length of public objects name table. Change this value if needed but before Does.Init() call. Stack public DOESStackElement Stack; Stack table. StackLevel public int StackLevel Current level of stack. Trace public IDOESTrace Trace Replace this field with reference to DOESTrace object to begin a debugging on Does.Execute() call.